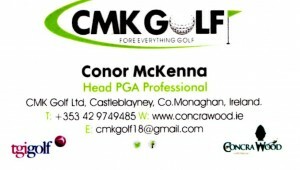 Head PGA Professional Conor McKenna offers a full range of golf services at his Pro-Shop- CMK Golf at Concra Wood. As a Partner in Europe’s largest buying group – TGI GOLF PARTNERSHIP, we deal with all major brands to suit your needs. Fellow golfers. As the Head Professional at Concra Wood I would like to formally introduce myself to members and visitors alike. I would also like to take this opportunity to thank the members of Castleblayney Golf Club at Concra Wood for their warm welcome. I began to play golf in 1990 at the age of 16 at Co. Armagh Golf Club and enjoyed 7 years competing in local and provincial tournaments. I represented the club at many levels before taking a position as assistant professional at Armagh G.C. under Alan Rankin. I turned professional in July 1997. 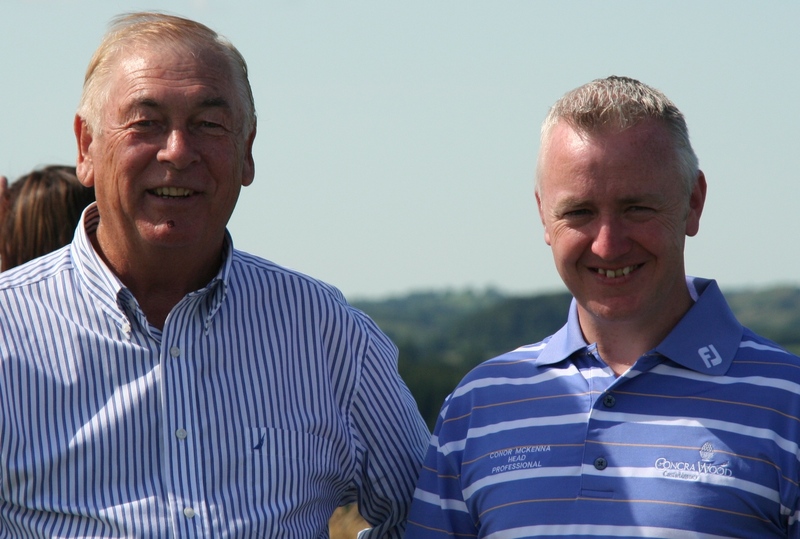 I spent 14 happy years at Co. Armagh Golf Club, working hard to develop a reputation as a coach and player. I have coached at a number of clubs and schools, including a summer programme in 2009 for Castleblayney Golf Club. As an Assistant Pro I helped to develop a competitive junior section at Co. Armagh Golf Club, for both boys and girls. I was also appointed as a Junior Golf Ireland coach, a coach for the Darren Clarke Schools League and a Development Coach for the ILGU. My goal was always to become a Head Professional at a golf club and after almost 8 years PGA Qualified, I finally achieved my goal in June 2010, at one of Ireland’s premier golf courses. Concra Wood is the most talked about course in Ireland at present and I feel privileged to be part of the team at Concra Wood. To complement the course and clubhouse, as Head Professional I provide the members and visitors with a well stocked and competitively priced golf shop. I offer a club repair service, custom fitting with a Flightscope Launch Monitor and tuition to all. I will continue to develop the junior sections at Concra Wood, as there are plenty of young boys and girls at the club. We already have a great group of boys who are playing to low handicaps. I would like to help improve their playing techniques and hopefully witness some team success in the coming years with them; these children are the future of Concra Wood! I look forward to meeting you all and getting to know you and maybe even helping you enjoy your golf a little more. One thing is for certain you will receive a warm welcome when you come to play Concra Wood.